So you want to take a tour in Scotland that will show you the best bits? Well, here's a description of what is a very popular route taken by visitors with limited time. In the trade, this one is sometimes called the 'milk run' as it's the most obvious to undertake if you take a look at the map. It's still worth doing though for a flavour of Highland Scotland. But you want someone else to take care of the driving, we recommend Rabbie's - they offer friendly small group tours all over Scotland. Obviously, if you want to be more creative, then you can find lots more tour description on this website, which should give you some ideas. 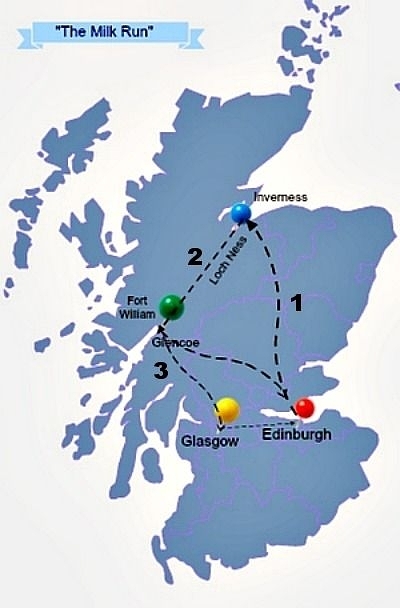 This particular 'standard' tour of Scotland splits into three sections. These you can see on the map reproduced here as well. This is our take on the Scottish 'milk run'. It starts from Edinburgh because most first-time visitors see Edinburgh first. So your route from Edinburgh crosses the Forth Bridge, then goes north up the A9 ‘the Highland Road’ to Inverness, the Highland Capital. Pictured here is the attractive main street of the little resort town of Dunkeld, right on the edge of the Highlands. You'll miss it if you keep hammering on up the A9. But then...time might be against you! Dunkeld main street - made for strolling along by way of a relaxing break during your journey. Chances are, you will just keep on the main road (or railway) - I bet - and find yourself in Inverness. From Inverness, I expect you'll stay overnight and visit Culloden Battlefield the next day. Plenty of people do. Then your itinerary takes you south again and goes down the Great Glen, via Loch Ness, to Fort William on the western seaboard. Perhaps another overnight here. From this point you can turn south for Loch Lomond and Glasgow or return to Edinburgh via Callander at the edge of the Trossachs, and Stirling. That's your trip in a quick summary. The A9 between Perth and Inverness. Certainly not all dual carriageway (divided highway). (Above) The A9 on an average day. Not the easiest of roads. One day it might be dual carriageway (divided highway) all the way to Inverness and make this Scotland tour more relaxing. Improvements are under way - which will mean road-works and hold ups. It's just a pity we had to pay for Edinburgh's tram system ahead of this lifeline road connecting Highland and Lowland. Look, I'll be frank with you...we are not fond of this road in its present state! Some of it is dual carriageway (divided highway) and some of it isn't. Drivers in a hurry get confused. Plus there are the roadworks mentioned above. The three sections of this classic Scottish tour. And to repeat: you can do this milk-run tour quite satisfactorily by public transport. Rail or bus to Inverness, bus down the Great Glen to Fort William. Rail or bus from Fort William to Glasgow. And car rental in Scotland is quite straightforward. By the way, rush hour in Inverness is not too stressful – certainly not as stressful as leaving Edinburgh with an unfamiliar vehicle on the first day of your journey! So let's look at the tour in sections. The A9 Edinburgh to Inverness has already been commented upon. That's marked '1' on the map here. Next comes the east coast to west coast section, Inverness to Fort William down the Great Glen '2'. Finally, the section '3' takes you back to Lowland Scotland and out of the Highlands, via Glen Coe, Crianlarich and Loch Lomond down to Glasgow (or Edinburgh - in which case you could take in Stirling with its castle). Finally – and don’t let me put you off, because - I repeat - thousands of visitors can’t be wrong – the Great Glen main road, the A82, between Inverness and Fort William can be very busy, tediously slow in places and is definitely the place to see impatient drivers at their worst. The special characteristics of the Great Glen are covered in our page that discusses the topic: is Loch Ness Worth Visiting. The most scenically spectacular section of this trip is through Glen Coe, after you've passed through Fort William. A National Trust for Scotland Visitor Centre covers the story of the Glen Coe massacre in 1692, when a company of Campbell militia, acting under government orders, turned on their Macdonald hosts, with whom they were billeted. This act of genocide has echoed down through the centuries. Yes, it’s chilling stuff – the more so because it happened within the gloomy confinement of this steep-sided craggy glen. Spring morning at Loch Tulla, edge of Rannoch Moor. (Pictured here) Morning mist rises over the peaks of the Blackmount, beyond Loch Tulla on the edge of Rannoch Moor. You can bag this sort of picture almost without stepping outside the car! Though on a lovely May morning like this, why would you not want to sniff the air, at least? Beyond the confines of Glen Coe, the return leg is across Rannoch Moor and another glimpse of wild Scotland. You can see why the heathery wastes of the moor inspired the pursuit scene when David Balfour and Alan Breck are hunted by the redcoats in Robert Louis Stevenson’s adventure story ‘Kidnapped’. The final leg of this conventional tour is by Crianlarich, turning south for Glasgow via Loch Lomond. The road by the upper part of Loch Lomond - that is, the section you reach first, as you are going south - is a bit narrow and winding but is always being upgraded and much of the loch drive is now straightforward. It needs to be as it carries a lot of traffic. 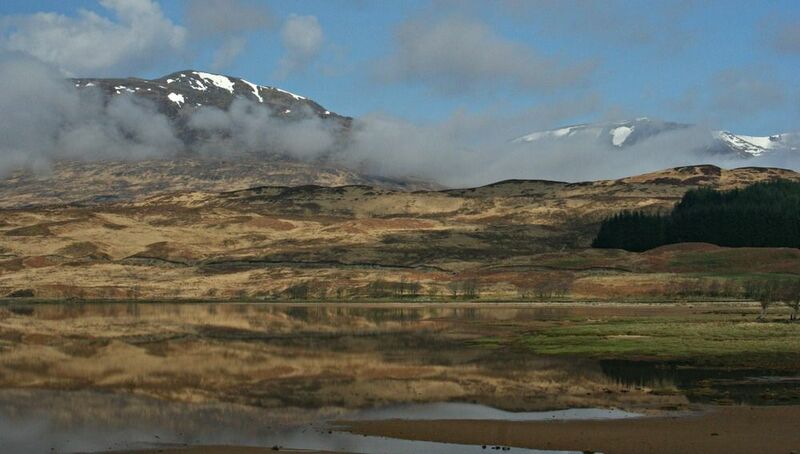 The Loch Lomond area, within the national park, is very popular. To be plain, it's been loved to death. Half the population of Scotland lives within an hour's drive of the south end of Loch Lomond. However, if you have taken the train from Fort William, then just relax and enjoy the views of mountain peaks, waterfalls and pinewood as the train descends through Glen Falloch down to the loch-side. If you have limited time in the city and are driving past the south end of Loch Lomond then the modern lochside complex of Loch Lomond Shores at Balloch should satisfy all your shopping needs!